Today, the item I was most interested in attending was at 11 AM: A discussion of how to make the WSFS Business Meeting more inviting. Jesi Lipp, who will chair this coming year's meeting, led the discussion. Helpfully, everyone attending had been to at least one WSFS meeting and therefore we could skip discussions of basics. I can't say we have made any brilliant breakthroughs, but there were a few things that Jesi may implement next year that sound promising. During the lunch break, Jesi, Linda D, Lisa, and I walked down to the shopping center and had lunch at the delightfully named Crepevine restaurant. With the various Christmas characters in the shopping center, I found myself sprayed with glitter from the Christmas fairy. 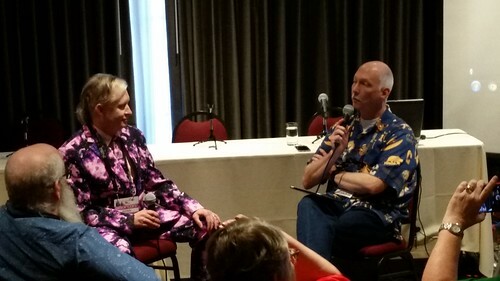 In an afternoon session, David Gallaher interviewed Kevin Roche about chairing Worldcon 76. It was a good discussion. This one was streamed on Zoom so that members of SMOFCon unable to attend were able to listen and ask questions, but none of the streamed items were recorded. Lisa and I carried her equipment down to the Flamingo Ballroom after main programming ended and she worked with the husband-and-wife tech team to get her camera connected to the sound board. Then we went to dinner with them in the hotel restaurant. At 9 PM (later than usual to allow people plenty of time for their dinner expeditions), the "Fannish Inquisition" started to a full house. Lisa was frustrated at the moderator bulling through without giving her any warning of when he was starting/ending any segment. Lisa did the best she did to guess and where to stop/start recording. Anything on the recording that looks like it started later or ended early is not Lisa's fault; she was given insufficient support from a head table team that as far as I can tell didn't really care about the recordings. However, the moderators did manage to keep the entire song-and-dance down to only two hours, even including SMOFCon presentations. 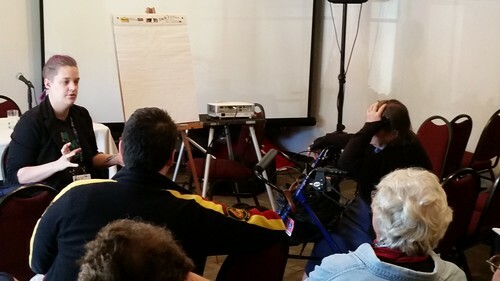 I was on stage myself as part of the CanSMOF bid to hold SMOFCon in Montreal in 2020. Cleveland is also bidding. This will be decided next year in Albuquerque, which was selected to host the 2019 SMOFCon without objection or opposition. I had to rush out as soon as the event ended because of my commitment to the Probability & Statistics Seminar, about which more later.